We’ve had a long year and our apologies for slowing down on the blogging! Many of our research assistants have wrapped up their work on the project – a huge thanks to Anya Zoledziowski, Alexander Kim, Peter Mothe, and Lauren Kaljur. If you participated in this project as an interviewee, we will be contacting you directly to let you know what the status of the project is. We are in the midst of finalizing transcripts and Candis has started on a book proposal based on the nearly 50 interviews we conducted across the Canadian North. Look for more blogs here over the next few months! The Arctic Journalism blog is starting up again after a year’s hiatus. We’ve been busy behind the scenes and continued to monitor news and tweets via @arcticjourno. Last summer and fall, our research team interviewed nearly 50 journalists working in the Yukon, Northwest Territories, and Nunavut. Our research assistants also completed part of their journalism internships in Whitehorse, Yellowknife, and Iqaluit. We’ve been working on getting the transcripts out to journalists we interviewed, and following up with those we still would like to talk with. If you’re working in Canada’s northern territories as a journalist, and would like to talk with us, please let us know by emailing us. Stay tuned for more updates over the summer and fall. Our research team will be in many communities across the Canadian Arctic during the next several months. If you are a journalist working anywhere in the Arctic, and you’re interested in participating in this project, please contact us. We will be conducting ethnographic research and interviews with working journalists in the Arctic in order to understand the changes that have come with digital technology and global audiences, and the challenges of reporting on environmental and economic changes. As well, some of our team will be directly contributing to Arctic journalism. Lauren Kaljur will be in the Yukon and Alexander Kim will be in Nunavut doing journalism internships in May, June and July. As part of the Master of Journalism degree at UBC, all students must complete 12 weeks of internship at a news organization. Part of being a Research Assistant for this project means heading to the Arctic for some of those internship weeks. In July and August, Candis Callison will be traveling with Lauren, Alexander, and graduating student, Peter Mothe (who interned last year in the Northwest Territories) to speak with as many journalists as possible in all of the Canadian territories. We will also conduct some interviews by video or audio conferencing if we can’t meet you in person. Our Arctic Journalism research team has spent the past half-month investigating where Arctic issues and communities figure into media and events related to the UNFCCC’s COP 21 in Paris. Here’s a quick summary of the work our research team has done. 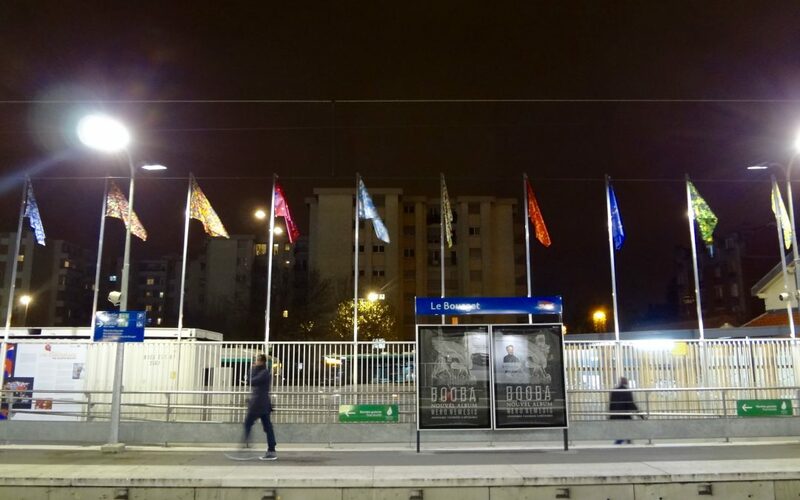 On our blog, Lauren Kaljur reported from Paris on many of the Arctic-focused events at COP 21 – even while she’s also filed stories for Open Canada and Arctic Deeply. You can find posts here on Indigenous community leaders, Arctic experts and leaders discussing media coverage and public knowledge, and collaborative art projects with Arctic communities. Alexander Kim conducted our analysis of Twitter, locating where and when #Arctic and #COP21 were talked about together. Despite the ways in which Arctic changes are used as primary evidence in discussions about climate change, Arctic-related hashtags neither featured in Twitter chatter about COP 21 nor did COP 21 feature much in discussions on the Arctic hashtags. Peter Mothe’s analysis of mainstream media built on the ongoing methods we’ve been using to look at how the Arctic is reported on in regional, national, and international media. One of our findings is that while many media reported on COP 21, international and national media hardly reported on Arctic communities. CBC ended up being the one exception in Canadian media. Canada’s national newspapers, The Globe and Mail, National Post, and Toronto Star never mentioned the communities who are dealing with the initial onset of climatic changes in the Arctic areas of Canada. I’ve been quarterbacking our team from Vancouver, and editing our website and Twitter account. It’s been incredible to see our research team come together, succeed at new tasks, refine our research methods, and deliver on the meaningful contributions we set out to accomplish over a year ago – all while we finish up the semester at UBC’s Graduate School of Journalism. It is sobering to see the lack of media coverage and social media chatter that reflect Arctic-based concerns and communities in the midst of global attentions to climate change, and the palpable disappointment amongst Arctic leaders about the Paris Agreement. Part of what we hope this research contributes to is a more robust discussion about how to report on the Arctic and Arctic communities. In the new year, we’ll be writing up our research for academic articles and continuing on with long term research goals. For now, it’s time for hiatus and a holiday break. 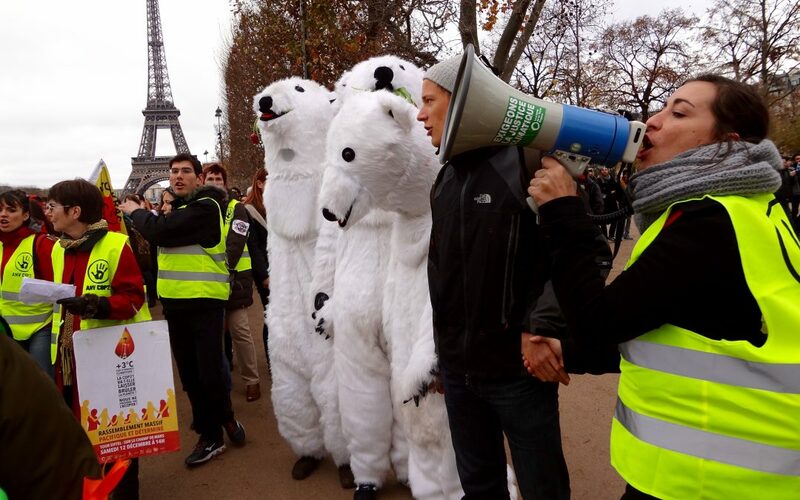 Thousands attended the final day of protests closed COP21 at the Champs de Mars, Paris. For the past two weeks global attentions have been focused on Paris, where delegates from nearly 200 countries convened to hash out an agreement to curb climate change. For the nearly 4 million people who live across the Arctic, the meeting had an extra sense of urgency. Climate change is already leaving its mark on the region, affecting everything from its landscapes to its wildlife to the health and lifestyles of its indigenous people. To make matters worse, climate scientists believe that the region’s climate is disproportionately baring the brunt of a warming world. According to the Intergovernmental Panel on Climate Change, over the past 100 years, average temperatures in the Arctic have increased almost twice as much as in the rest of the world, and some models suggest that this could only get worse in the future. So when Arctic leaders and scientists traveled to Paris, they hoped the world would commit to slowing down climate change everywhere, but especially in the Arctic. But the final agreement reached by delegates on Saturday had no specific mention of the Arctic. While we don’t know the reasons behind this omission , the small number of tweets about COP 21 that mentioned the Arctic suggest that the Arctic was not high on social media radar. If this is the case, there might by something to say about the role that news media played in this matter. The Arctic Journalism team at UBC’s Graduate School of Journalism analyzed how journalists around the world talked about the Arctic in the context of COP 21. We focused on 10 media outlets: three were international (The Wall Street Journal, The New York Times and The Guardian), four were national Canadian news sources (The Globe and Mail, Toronto Star, CBC News, and National Post), and three were regional news outlets from northern Canada (Whitehorse Star, Northern Journal and Nunatsiaq News). We focused on articles published between Nov. 28 to Dec. 12., and searched for articles that discussed the Arctic (or the Canadian North) in the context of COP 21. 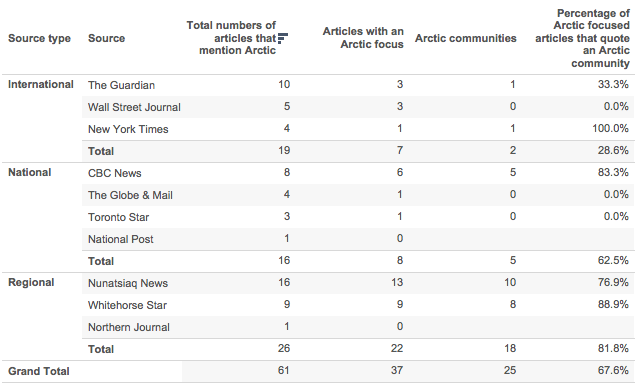 In total, 61 articles mentioned both the Arctic and COP 21. Of these, only 60.7 percent, or 37, focused specifically on the Arctic. That’s an average of .24 articles per news source per day of coverage on one of the regions which is most directly affected by climate change. 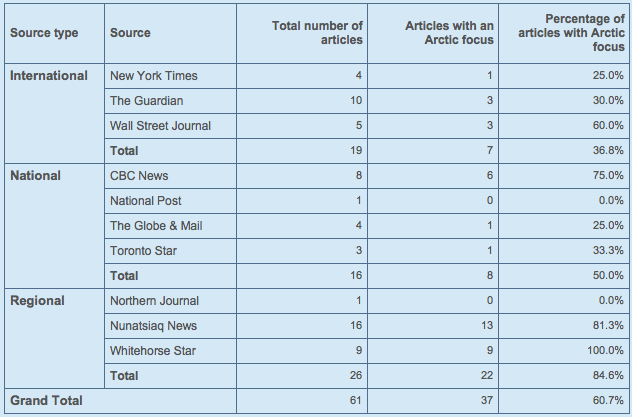 Most articles about COP 21 that focused on the Arctic were from regional news sources from the Canadian North. 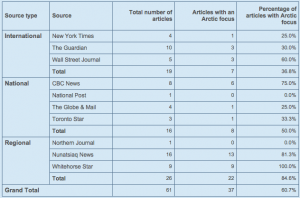 Regional news sources from the Canadian North focused way more on the Arctic than international or national news sources. On Nov. 24, just a few days before COP 21 officially started in Paris, YouTube tweeted out an image of a polar bear on a shrinking patch of sea ice. Although the tweet was retweeted over 600 times, it had one tragic flaw: it got the region’s population wrong by 4 million people. Although it’s clear that YouTube is not a news source, I mention the tweet because it’s a reflection of a bigger issue. 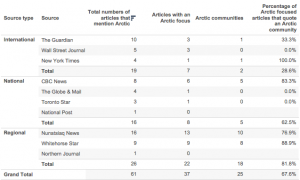 In international media, Arctic communities were rarely mentioned or quoted. And the situation was worse in national Canadian news sources. Except for the CBC, none of the three other news sources mentioned or quoted Arctic communities, which is especially problematic, since roughly 100,000 people live in the Canadian Arctic, which also makes up 40% of the country’s landmass. So who did get quoted? In terms of who actually did get quoted in Arctic-focused stories, the situation is quite varied. International news sources focused more on scientists or scientific reports. The Wall Street Journal didn’t quote Arctic communities, but ran an opinion piece written by two climate deniers. Exclude the CBC, and the very limited national Canadian sources focused primarily on activist groups. Regional sources were way more varied, but focused primarily on Arctic communities, elected officials, and transnational governments–especially the Inuit Circumpolar Council, whose president Okalik Eegeesiak from Nunavut was in Paris representing Arctic communities. In terms of the chronological distribution of articles, it seems as though interest for the Arctic during COP21 started off strong, but declined steadily as the meeting dragged on. When French Foreign Minister Lauren Fabius announced that the delegates of 196 countries had reached a historic agreement on Saturday, Dec. 12, online commenters around the world jumped to pitch in their opinion on the deal’s final text. Arctic voices, such as that of Okalik Eegeesiak from the Inuit Circumpolar Council, were clear in their rejection of the deal. Her “Countries failed!” tagline after every message on Twitter is a reflection of the frustration lived by many in the Arctic. The omission of any Arctic specific language from COP 21’s final agreement means that even if the world does manage to keep global warming “well below 2 C,” the impact on the Arctic will be huge. 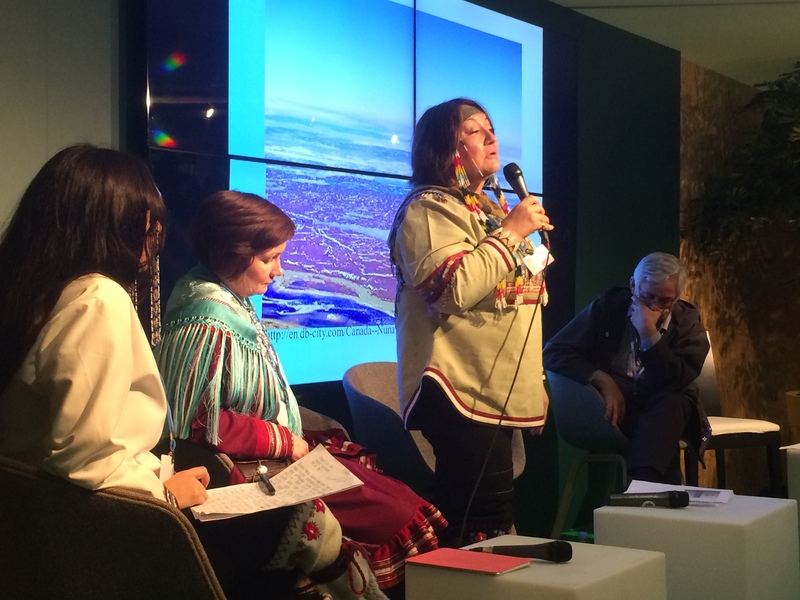 During the concluding hours of COP 21 negotiations, a panel of notable Arctic voices gathered to discuss their varied understandings of security in their region. Consensus emerged on one central point: public knowledge of the Arctic is severely lacking. Few citizens within the eight Arctic nations can identify the existence of the Arctic Council, according to an EKOS poll earlier this year. As the Arctic undergoes dramatic climatic changes and becomes increasingly subject to the gaze of outside interests, correcting this knowledge-gap is critical. 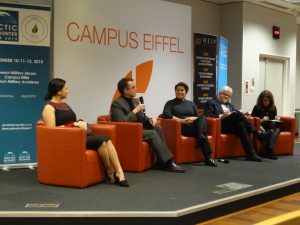 Panelists for Arctic Encounters Symposium’s “Arctic Think Tanks Night” debate foreign politics at the Campus Eiffel in Paris. 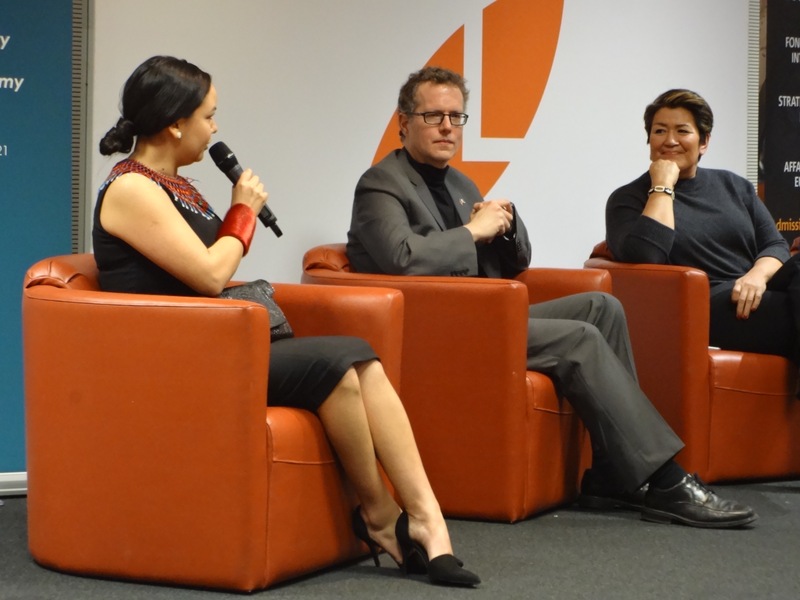 Among the panelists were scholars from the U.S., Denmark and Iceland, the former Prime Minister of Greenland who is now a Member of the Danish Parliament, and the president of the National Youth Inuit Council of Canada. 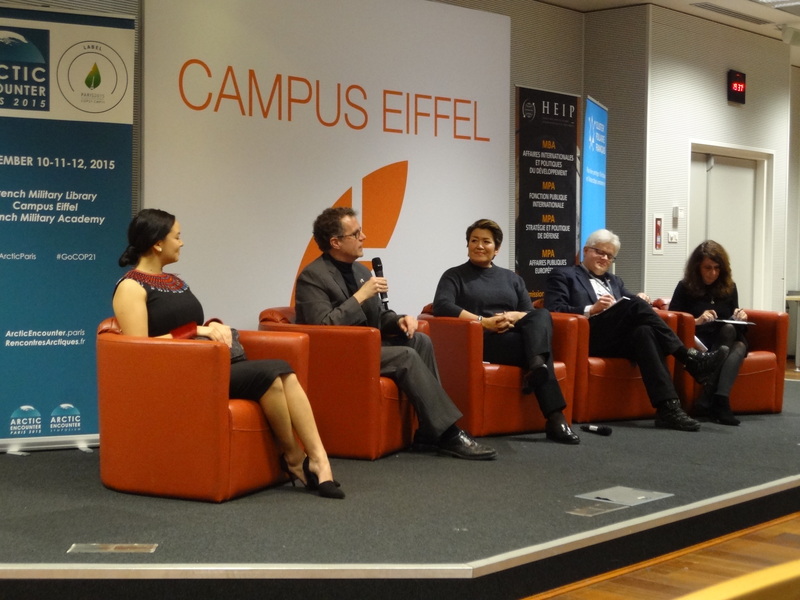 Complexities of the Arctic are often lost on journalists and their audiences, panelists agreed. While many media would like to tell sensationalist stories of a far-away land of melting ice and starving polar bears, or as a zero-sum game of an aggressive Russia overstepping its geopolitical boundaries, the reality is a tightly knit web of social, economic, political and cultural dimensions. Above all, as the two indigenous panelists pointed out, it is a region of people with a long history of Arctic sovereignty. When it comes to security, the issues revolve around the contemporary paradox binding the Arctic; at once climate change is dramatically changing its landscape while also opening up trade routes and resources. All this within the span of a generation. Youth leader Maatalii Okalik remarked that the scramble for Arctic sovereignty completely ignores the original sovereign people of the Arctic, the Inuit and Saami. Eloquently identifying the challenge of living in a continuation of colonialism, she addressed the perpetuation of racism in the Inuit experience with the government of Canada. Narrow media coverage often misunderstands the deep history and real challenges facing the Arctic. Danish MP Aleqa Hammond identified the difference between media reported from the “inside versus the outside,” with local media far more reflective of the human reality. That Russia has, contrary to popular understanding, been consistently using all of the legal rules and mechanisms available through international law to establish itself, as its economic development largely hinges of development of its Arctic regions, as pointed out by Anita Parlow, a recent advisor to a Harvard-MIT Arctic Fisheries Project. The approximately 400,000 indigenous peoples in the Arctic are not “living museums,” they are continuing to adapt to a changing environment. Far from passive victims, they have lived side by side with some of the most dangerous creatures on the planet in extreme conditions for thousands of years, as pointed out by both indigenous leaders. 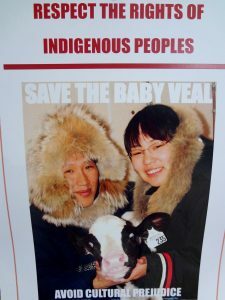 The global media attention on the seal hunt has had very real and dramatic consequences on human lives. The EU-ban transformed society overnight, as people lost a staple food source and couldn’t pay for electricity, Hammond explained. Suddenly, their hunting practices went from a source of cultural pride to an act of shame. She wondered if the polar bear, given its newfound symbolism for world environmental health, is the next ban in the forecast. Those panelists more inclined to a classical international relations view of Arctic security agreed that contrary to popular sensationalist media representations, the region is unlikely to implode into World War Three. As with other geographical regions that entangle many interests, it is in nobody’s interest to start a war. Parlow acknowledged that one foreseeable litigation-based conflict could be around fisheries conflicts as the economically important fish stocks become more unpredictable, changing territories with warming waters and shifting currents. Parlow pointed out that social media networks and information sharing was changing the way the Arctic was understood, and increasing the amount and availability of in-depth journalism and blogging on Arctic issues. As Hammond pointed out, Greenland is almost completely independent from Danish rule, yet still suffers from accusations of incapacity and dependence. Few people realize Greenland is 70 per cent fossil fuel free, and if it did become fully independent it would have rights to a large fish stocks and mineral resources as well as surplus hydro-power that could fuel new industries on their own terms. Okalik shared the Inuit experience of media misrepresentation. Contextualizing representation within its colonial reality, she explained that the only reason efforts were made to understand the Inuit in the past was to make claim to their territory. She also addressed the fundamental misrepresentation in framing indigenous interests as monetary and material, as this too is a colonial imposition. The only reason indigenous peoples engaged in Treaty negotiations, she said, was to be considered equal and “civil” and to continue to live on their lands. Panelists for Arctic Encounters Symposium’s “Arctic Think Tanks Night,” debating the impact of climate change on Arctic security and defense. “What happens to the Arctic doesn’t stay in the Arctic,” is a common expression for this region. It alludes to the major climate implications for the rest of the world as the sea ice and permafrost continue to melt, as well as the various political and economic interests this creates. As far as global climate security, one writer for an environmental news wire commented in question period that substantive matters of climate mitigation and adaptation were absent from the debate. Indeed, the Arctic conversation seems to move from climate realities to strategy and resource development very quickly. The Danish scholar Rasmus Gjedssø Bertelsen pointed out that many nations are not asserting themselves because of a genuine interest in the Arctic, it has much more to do with geography and transport routes, access to which states will likely sort out in due time. While think tanks, university-associated and otherwise, can be a positive contribution, Parlow noted that knowledge-creation requires resources. Research is driven by interests and leads to lobbying, resulting in the reassertion of power differentials. As Maatalik expressed, very few people are addressing the needs of the indigenous peoples of the Arctic nor are they interested in long-term well-being and development, as statistics can corroborate. Those who do want more than just the wave of a geopolitical flag are seeking resource wealth, a logic of extraction that largely benefits people elsewhere. She noted that rent in her city of residence, Iqaluit, is around $3,000 a month for a one-bedroom apartment and food costs are equally enormous. After 12 days of negotiations for COP 21, nearly 200 nations have adopted an agreement to fight climate change. Throughout the conference, we’ve been monitoring #COP21 on Twitter because we’re interested in how the Arctic fits into international discussions of climate change. This is what we’ve learned. From November 30 to December 11 we recorded 3,073,710 tweets sent with the hashtag #COP21. The most popular hashtags used in conjunction with #COP21 were #climatechange (8.7% of tweets), #climate (4.0%), and #paris (2.1%). The most frequently mentioned users were @cop21, the official French-language account for the conference, US President Barack Obama, and French Foreign Minister Laurent Fabius. The top #COP21 retweet was an image posted by astronaut Scott Kelly showing the coast of Argentina and Uruguay from the International Space Station. On November 30, there were over 600,000 tweets sent using the hashtag #COP21–the most we ever saw in one day during the monitoring period. Nowhere near that many #COP21 tweets were sent in a day until the Paris Agreement was announced at the close of the conference on December 12. About 457,000 tweets with the hashtag #COP21 were sent that day. Of the 3,000,000+ #COP21 tweets sent during the conference, only 9,972 mentioned the Arctic*, 0.32% of the total. *Note: Thanks to real time feedback on Twitter, we used the following keywords to search for mentions of the Arctic: Arctic, Arctique, Arktis, А́рктика, Arcticpoli SavetheArctic, ArcticParis, polar, Yukon, ykpoli, ytpoli, “Northwest Territories,” NWTpoli, Nunavut, Nunavutpoli, Alaska, Greenland, Inuit, Saami. After the Paris Agreement was announced on the morning of December 12, over 141,000 tweets were sent that day mentioning it. Of those, only 66 mentioned the Arctic. 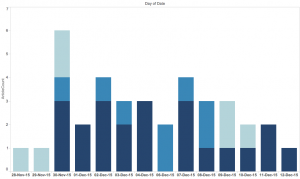 The week before COP 21, a daily average of ~32,000 tweets mentioning the Arctic were made per day. During the conference, that daily average fell to around ~27,000 tweets per day. There was a significant spike in Arctic tweets on the second day of the conference, but much of this is attributable to Greg Fisk, the mayor of Juneau, Alaska, being found dead mysteriously in his home. Nearly 12,000 of the Arctic tweets recorded on December 1 concerned the death of Greg Fisk. Only around 3% of Arctic tweets used the hashtag #COP21. Note: In our earlier Twitter analysis we reported an average of ~6,700 Arctic tweets per day, a significantly smaller number than is reported here. We had also reported that an average of ~11% of tweets used the hashtag #COP21 where here we report that only ~3% did. These discrepancies are due to a methodological error with the way we configured our social media analysis software. This gave us an incomplete data set. We have since fixed the error and refined our data collection methods. During COP 21, a daily average of about 830 #COP21 tweets concern the Arctic. We found considerable variability in day-to-day volume, ranging from 208 to 1497 tweets. These tweets tended to concern events and demonstrations. For example, around 15% of #COP21 tweets that mention the Arctic are about “Ice Watch,” the 12 blocks of Arctic ice melting in front of the Place du Parthenon in central Paris. Another popular topic is a demonstration put on by Greenpeace featuring a giant mechanical polar bear, held on December 9. On December 10, NASA hosted a live stream on how “Arctic changes impact us all,” generating another burst of Twitter buzz. The Arctic was not a hot topic for the COP21 discussion on Twitter. The miniscule proportion of #COP21 tweets that mentioned the Arctic may or may not indicate how the Arctic fits into discussions of climate change in general. Perhaps the Arctic’s moment just hasn’t come yet, or it just hasn’t happened on Twitter. 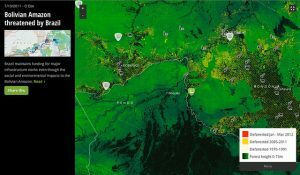 Journalists and a global group of innovative partners are using a suite of new technologies called Geojournalism to change reporting on climate and the environment. Geojournalism synthesizes large datasets to visually represent complex, place-based, environmental challenges such as Indonesian peat fire atmospheric poisoning and illegal rhino hunting in South Africa. 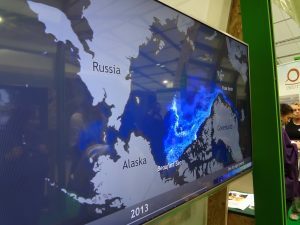 Showing the colourful, interactive graphs and maps on slides to a full audience at COP 21 last Sunday, journalists and researchers demonstrated how this collaborative work can help contextualize complex regional and global problems. River systems, mountain ranges, and coastlines affected by climate change know no borders. At the same time, an incredible amount of scientific data on climate-related challenges exists “out there” already. The gaps, according to Internews’ Earth Journalism Network, partners in the project, are in getting the troves of inaccessible PDF-formatted hard data to the public, policymakers, and journalists who need them. Effective use of technology for translation and packaging for the layperson is a critical tool to for the world’s key information disseminators: journalists. The power of data and visual journalism to tell a story has become increasingly evident. The New York Times has used data to great effect in representing issues like Bangladesh’s disappearing land, presenting reality in this way makes critical events happening far away from American audiences both immediate and palpable. By taking on the exhaustive and often slow process of mining datasets into geographic data visualizations, this network is ensuring scientific findings are being represented accurately, they explained. Through a rigorous methodology, they hope their work will be used by mainstream media outlets, large and small, that lack the resources to do this work themselves. Sharing methodologies and hosting tutorials are part of the project. Their work was most recently picked up by The Guardian for this article about Tibetan plateau bottled water. Through funding help from their partner donors, Earth Journalism Network is helping support independent environmental journalists with their own on-the-ground investigative reports and algorithm syntheses that often don’t get support elsewhere. Deforestation in the Amazon visualized through Geojournalism. This “democratization” of the process ensures community place-based reporting continues to put a human face on climate science. It also ensures that human rights related to being mapped and archived, or not, are respected, the Program Officer of Internews’ Earth Journalism, Willie Shubert, said. “We want to be having a dialogue about what should and should not be mapped,” Shubert continued. Shubert explained they are trying to shift away from a reliance on top down information mapping based on the biases of Google and other massive players. A concerted effort is also made to ensure the mapping is open-source. One presenter, Ramesh Bhushal of the Third Pole Data Network, referring to the world’s third largest store of ice and water, the Himalayas, was dubbed a “data wrangler.” His nickname alludes to the challenge in accessing certain data sets, and the great opportunities for open data-sharing once initial access is granted. Newly-launched Open Earth is a multi-site host to nine regional Geojournalism sites. 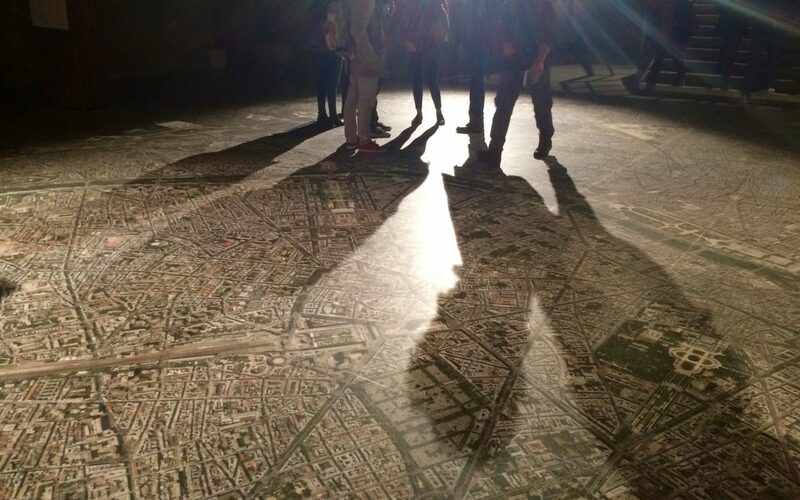 They are creating a meta-network of data mapping to further expand and enhance the project. By tagging and geolocating environmental journalism pieces, Geojournalists can identify gaps in reporting. They can then work with collaborators to fill these “empty spaces” by funding reporting in places that need investigation, research, and the inclusion of community voices. An example of such a region is the Arctic. While this massive geographic space is changing the most dramatically due to climate disruption, it is also one of the least reported on. Though in its very early stages of its Arctic reporting, Earth Journalism Network has sent reporters to and gathered reports from Siberia, Finland, and Canada in order to report on regional concerns such as food security and impacts of climate change on traditional subsistence and culture. 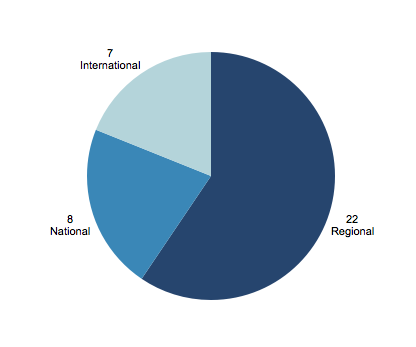 Other regional reporting project includes tracking government assistance for climate adaptation. “Geojournalism allows us to recognize more than ever the importance of the Arctic,” Willie Shubert, explained. By making connections with environmental reporters all over the world, this kind of journalism creates collaborations that bolster representation in a geographically and politically fragmented region. 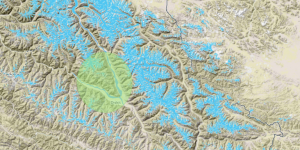 Though the process of building large scale Geojournalism projects is slow, the enrichment for analysis and context creation is worth it, the various project organizers explained. This kind of reporting debunks inaccurate climate change related assumptions. While many think that as southern latitudes get hotter they can just migrate north, deep environmental journalism can represent what people might find there. As permafrost melts on a large scale, they are tracking what ecological state is left behind. 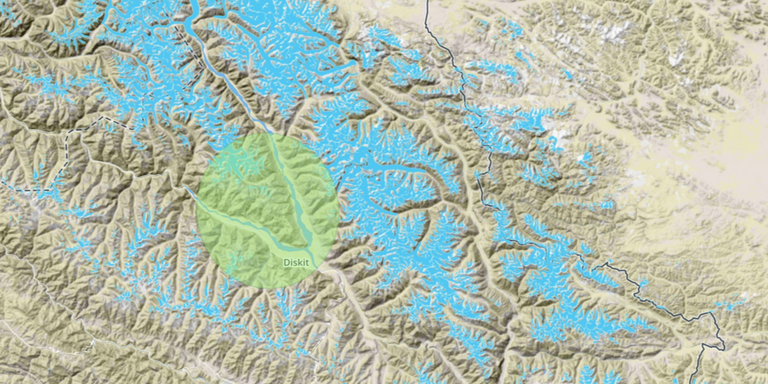 The Third Pole Data Network maps water and ice flows in the Himalayas. Human-impact focused journalism with a large contingent of developing-world journalists is changing how climate negotiations are covered, Shubert explained. December 8 was a big day for the Arctic at COP 21. Saami and Inuit leaders gathered at the Indigenous Pavilion to celebrate and caution delegates about the needs of their region. Cathy Towtongie, President of Nunavut Tunngavik, the beneficiaries of the Nunavut Land Claims Agreement, is a traditional seamstress whose elders taught her the ancient methods of clothes-making and are no longer alive. She described how she can see climate change in the animals. On caribou pelts, she can see the frailty of the muscle fibres from environmental stress. She said the warmer temperatures mean that she cannot find a parasite-free river in which to wash the hides. Birds they’ve never seen before are migrating to the Arctic. Towtongie speaks to the crowd about changing climate and changing ways. Towtongie was part of a panel of speakers sharing the intimate ways in which climate change is affecting the everyday lives of the people of the Arctic. Their panel was accompanied by the Premier of Nunavut Peter Taptuna, and the Minister of Finance and Domestic Affairs for Greenland, Vittus Qujaukitsoq. What forest is to many indigenous groups so snow is for the Inuit and Saami, and it is changing fast, they explained. The ice and permafrost melt is literally changing the ground beneath their feet. Ancient hunting paths are thinning so rapidly they can’t hunt safely in some places. As storms increase in frequency and size, even their impressively accurate traditional knowledge can no longer predict the weather patterns. Saami artist Sofia Jannok introduced the panel of speakers with sound and stories of the Saami reality. If anyone wants to know how to best sustain the reindeer herds alongside energy projects, they must ask their herders, the Saami people, she said. Describing the custom of leaving a bit of coffee in one’s cup to return it to the earth, she explained how her culture is not one to take everything. Through respect for the earth’s bounty, they ensure their future survival. Towtongie, described the laws in place in Nunavut that fine the wasting of polar bear meat. Everything is used. Traditional knowledge also means effective, cooperative forms of government. For a people that have learned to adapt and survive at fifty below centigrade temperatures for thousands of years, it is no wonder they are masters at listening and partnership. Like the global south, the peoples of the Arctic are suffering disproportionately from unsustainable fossil fuel development. Maatalii Okalik of the Inuit Youth Council addressed the need for indigenous human rights language in in the COP 21 text. She called for recognition by the international community of the human caused impacts from climate change on people, wildlife, and the ecology. Premier of Nunavut Peter Taptuna expressed the need for assistance in adaptation and climate mitigation. “The task is so great, and resources so few,” the Premier said they can almost consider the region a developing area. Yet, their needs are not equated as such because they exist within eight wealthy northern nations. Inuit Circumpolar Council Chair Okalik Eegeesiak said we must build on our community consultation and partnership successes. Only by combining forces can we mitigate the mass disruption to the Arctic and the planet in which it is inextricably linked. As Eegeesiak said, no single level of government can solve the climate disruption to the Arctic. The Arctic seems to face two oscillating extremes. Either it is ignored all together as a region, or it becomes the emotional symbol for all of humanity. Neither representation offers substantive help or solutions. Passive victims the Inuit and Sami certainly are not. Thanks to hard work and organizing as a region and with allies from other indigenous supporters, they are making progress. Minister Catherine McKenna announced last Sunday a commitment to 1.5 degree warming, a figure indigenous groups alongside other vulnerable groups such as small island states have been pushing for, even though that temperature already consigns them to dramatic change. As Premier Taptuna explained, temperatures are amplified by a factor of three in the Arctic. Eegeesiak also noted the commitment of Canada to press for the inclusion of indigenous rights in the text of COP 21, as a welcomed improvement. The ICC, representing 155,000 Inuit in Chukotka, Alaska, Canada, and Greenland, have or are in the process of producing numerous summits and declarations on matters from sovereignty to wildlife to mental health. As Áile Jávo, President of the Saami Council explained, her people have their own parliaments in three of their four national governments, which include Norway, Sweden, Russia, and Finland. 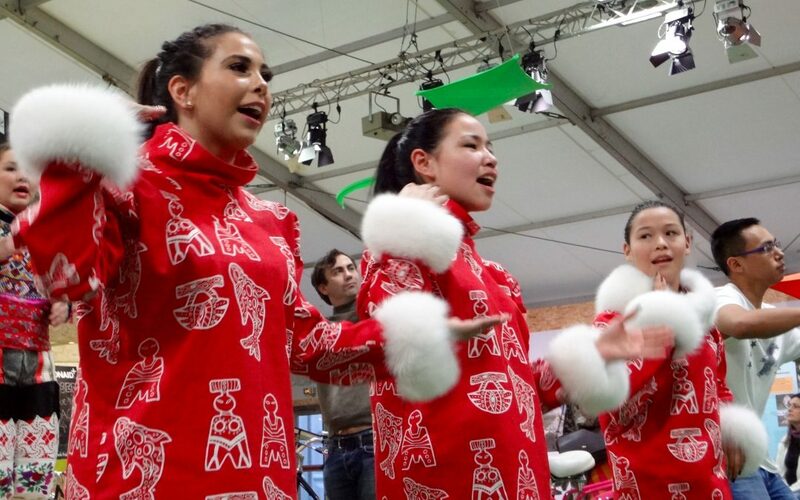 Their people are represented at COP 21. Jávo said she hopes one day her people can move beyond basic rights and towards their own governance. Nonetheless, she said, their participation on the Arctic Council is proof that the recognition of rights and cooperation are possible at an international level, and can lead the rest of the UN states by example. The Arctic youth are equally strong and organized, as demonstrated by Maatalii Okalik. She spoke eloquently about how her connection to land and her elders, known as knowledge keepers, makes her a better person. “My people are experts on land and conservation,” she said. “We want to determine for ourselves our social economic and political way of life. 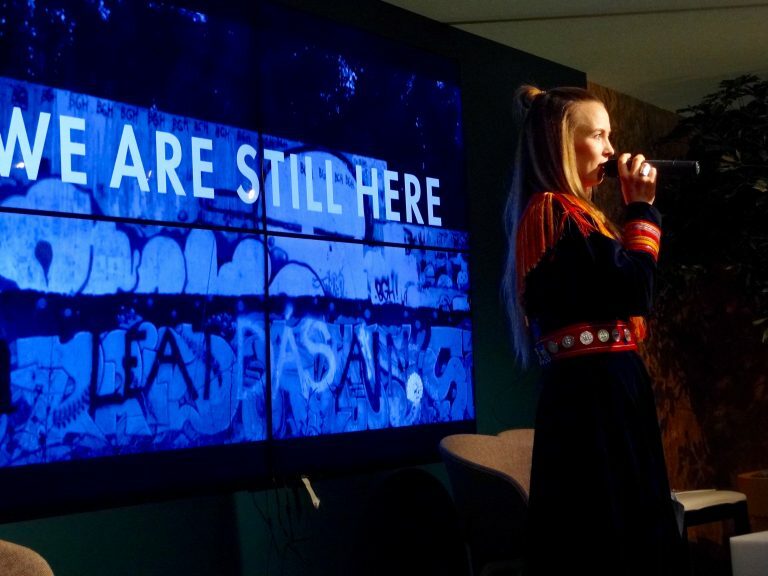 Sami singer Sofia Jannok performs at Arctic Day in the Indigenous Pavilion for COP21 attendees.